No matter what your sport is, your athletic shoes are one of the most important pieces of equipment. From tennis to running, basketball to soccer, choosing the right athletic shoes for the right reasons can make a huge difference in keeping your feet and body healthy. Below you will find some of the things you need to consider when choosing shoes for your sport. I know that it can be hard to pass up those awesome looking shoes that match your uniform perfectly, but in the long run, the most important thing is that the shoe serves its function...to support and protect your feet. So, lets take a closer look at what makes a good athletic shoe. When I explain shoes to my patients, I always start with the heel box. This is where most people are similiar in their needs. A sturdy heel box is essential to help control your rear-foot during athletic activities. 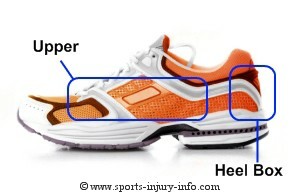 The heel box is essentially the back third of the shoe, that surrounds your heel. 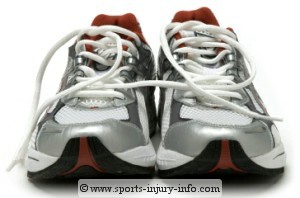 Most athletic shoes have a heel box made up of leather, and some type of plastic or rubber re-inforcement. However, not all athletic shoes are created equal. To test the heel box, try bending it over, or squeezing it in, and see how much resistance you encounter. If you can easily fold over the heel box, then chances are you will not get much support. To determine what type of foot you have, grab ahold of your foot with both hands, and move it around. Try moving individual bones around...do you find lots of motion, with little resistance, or is your foot very rigid, with little movement. You don't have to be an expert to tell if you have a flexible or rigid foot. Your athletic shoe should be opposite of your foot type. For rigid feet, you can get by with mesh or other light materials for the upper, as you need less support for your foot. For a flexible foot, you should lean more toward a rigid upper, that will control excessive motion and reduce stress. Even the perfect shoe will wear out over time. 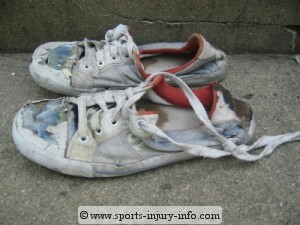 I have seen quite a few injuries due to old or worn out shoes. Just like any other equipment, you should monitor your shoes, and replace them when they wear out. If you are a runner, monitor your mileage, and replace them as appropriate. How do you know when to buy new shoes? Well, holes, or pieces falling off are generally good indicators...But if it isn't that obvious, look for all of the qualities that you used to choose the athletic shoe in the first place. Is the heel box still sturdy? 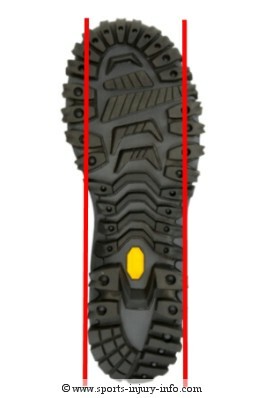 Is the upper as rigid as it needs to be to control your foot? Is the arch still in good shape, or have you worn down one side of the sole? Answer these questions, and inspect your shoes often to keep them protecting your feet. Good shoes don't have to be flashy, or expensive to serve their intended purpose. There are lots of shoes out there that will fit both your needs and your budget. Look for all of the right qualities to fit your foot, and you are sure to make a wise decision. And when in doubt? Discuss shoe wear with other athletes, and the sales person at the shoe store. Chances are they have some good insight. Or, ask your athletic trainer. Do you have a favorite pair of athletic shoes? Good athletic shoes are sometimes hard to find. With so many choices out there, it helps to have a little advice. Tell us about your favorite pair of athletic shoes, and why you think they are the best. From great support, to awesome looks, let us know which shoes are on your feet and why. Your story will appear on a Web page exactly the way you enter it here. (edited for grammar and spelling) You can wrap a word in square brackets to make it appear bold. For example [my story] would show as my story on the Web page containing your story.